Shared Inspiration by Jill Jacobsen: More "Fresh Cuts"
Well, here is another card using the new stamp set that will be in the Fall/Winter Catalog in August. We are making this card at my club workshops this month. I used the Color Challenge from Splitcoast. Sage Shadow, Very Vanilla and Chocolate (I also added some Handsome Hunter). 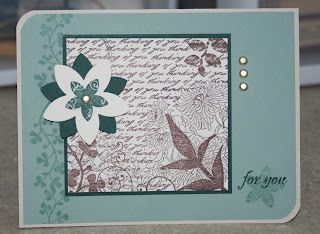 The base is Natural Ivory, the layer is Sage Shadow, stamped with the same ink with the sprig. I stamped the main image in Choc Chip and trimmed it close and layered it on Handsome Hunter. The flower in the lower corner was stamped with Sage Shadow and the verse in Handsome Hunter. I used the 5 Petal Flower punch with Handsome Hunter and I stamped the small flower on Very Vanilla and punched it out as well. I put a gold brad through and adhered it with a Glue Pop Dot. I also added the 3 brads on the right side. whooo!! I really like this card. Can't wait for Sat. class.